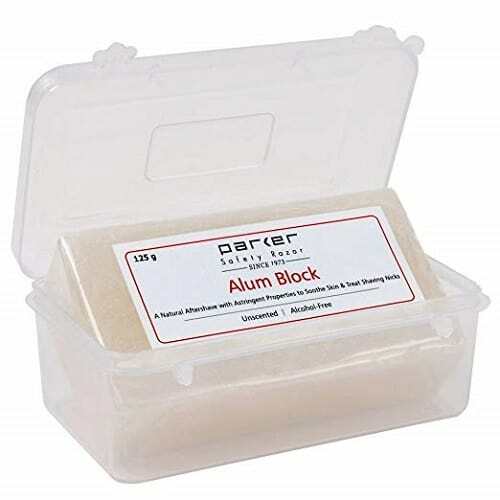 Alum blocks are becoming more and more popular and have been resurrected from historical barber shop use. They are a great way to eliminate unwanted impurities in the skin during shaving and are a must-have for men who regularly nick themselves during the process. They offer a wide range of benefits and are relatively cheap and long lasting. Alum bars may be available in a complete beard grooming set. However, not all alum blocks are created equal, and this article aims to help clarify what the best options are. This article will also be helpful for those who have never used or even heard of this grooming essential to better understand why they should start using one today. Like everything else in your shaving and trimming repertoire, having the proper alum block and the best straight razor will serve you well. Additionally, those with sensitive skin should read this article as well and understand why alum may not be suitable for your skin type. Alum is a compound or stone that looks much like a stone. When moistened with water and softly applied to the shaving area, it acts as an astringent and also has the ability to counteract razor burn. It can also stymie bleeding from small cuts and nicks on the face’s many contours. 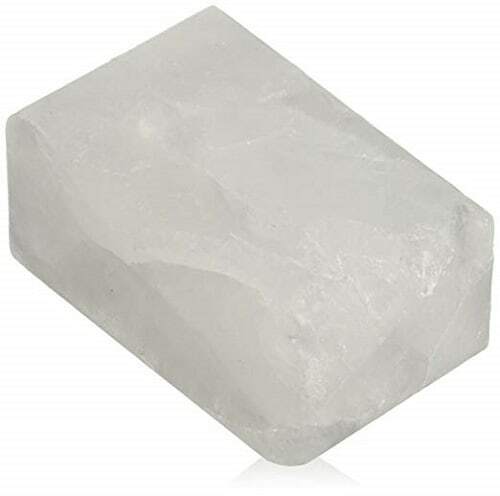 Alum blocks are also used for their antiseptic properties. This means that it will not only leave your skin feeling refreshed and cooled after shaving but eliminate harmful surface bacteria as well. Alum has been used by cultures all over the world for millennia. It was first used over four thousand years ago by the ancient Egyptians. 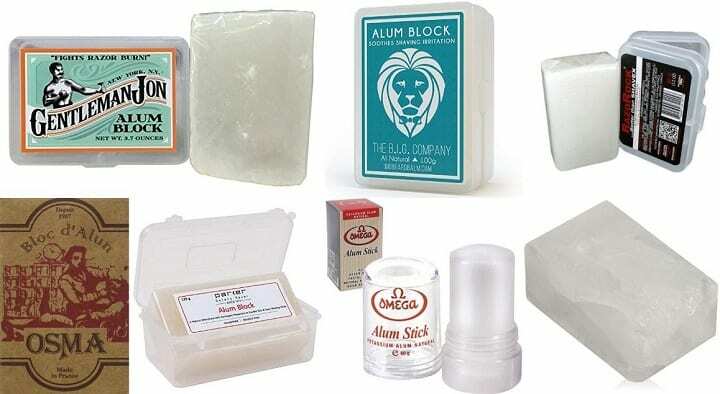 The alum block could be considered the original aftershave. It contains mineral salts, which the ancient Egyptians utilized for its healing and antiseptic properties. Since that time, alum bars have been used for shaving as well and continue to be a popular item for the avid shavers, like shavettes and safety razor blades. 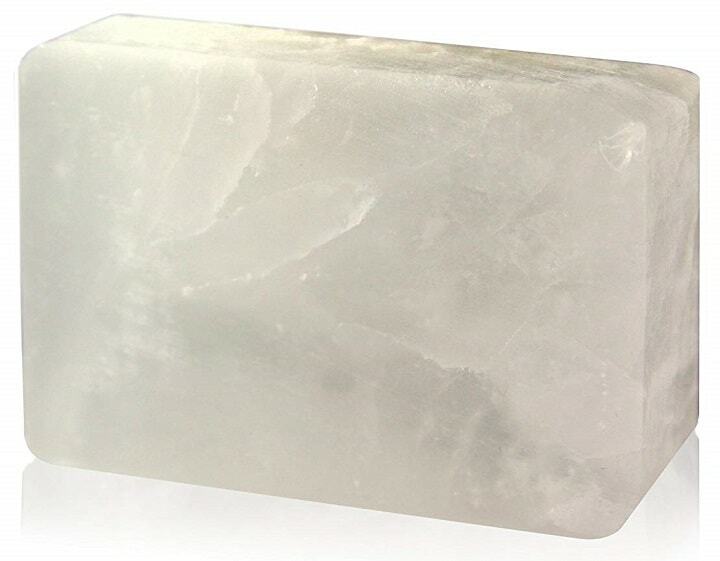 There are many great benefits to using the alum bar, particularly its antibacterial properties. Beyond keeping the skin generally clean, those who suffer from acne will find that the minerals in the block may help to clear the skin. This is especially beneficial if you have to shave in areas that break out easily. Those areas can be a nightmare to shave and leave you in pain afterward. Furthermore, constantly shaving over and cutting into acne spots can cause scarring in those areas, and alum can help prevent that, similar to the styptic pencil. Those with naturally greasy skin will also see an improvement in their skin complexion. Simply apply the block to greasy spots and watch the grease disappear! Those with acne and other breakouts should use it right before going to bed for the best results. Note that the block should not be used every day as it can cause drying and cracking or else cause the skin to produce even more oils. One of the greatest benefits of the block is that it works to combat bleeding from cuts and nicks. The salt that occurs naturally in the alum coagulates and stops the bleeding process in its tracks. No more discovering those blood red and brown stains on your nice white Oxford ever again! Because of the bar’s natural ability to dry the skin, alum has been used for centuries in the Middle East and Asia. Apply the bar to the armpits and experience an all-natural alternative to being sweat-free and smelling great! In the same way, the alum prevents bleeding skin after a shave, the salts work to prevent pores from producing and excreting sweat. If you already use a deodorant and want to stop the sweating as well, alum has no scent and will not conflict with your favorite bar. If you are getting any type of wax treatment done, use alum to the affected area after the procedure. Remember that it is safe for sensitive areas of the body. To be clear, alum is used as an aftershave tool, not before. It is not used to clean the face, and it is not the best face wash for men. The whole point is to rub it into the freshly shaved area. There are several steps to consider when using these grooming bars. Be sure to heed these instructions carefully in order to get the best shaving experience. Get the alum wet with water. It is best to use cold water when wetting the block. Rub the wetted bar onto the newly shaved skin. Be gentle in this process. You do not want to rub it in so hard that it irritates the skin. Once the entire shaved area has been thoroughly covered with alum, let it dry on the skin for a minute or two. Rinse any excess product off your face if you are going to apply a beard oil or beard balm to your face. Be sure to pat your face dry before applying the oil. After using the bar, clean excess lather off the bar to keep it from building up scum. Dry the bar off and keep the bar in a cool dry place that breathes well. Drying your alum bar is very easy. After each use, make sure to rinse the block off with water. This prevents the bar from building up grime over time. Furthermore, you do not want the moisture on the bar to attract bacteria, mildew, or mold. After you have thoroughly rinsed it off, simply take a dry towel or cloth to the bar. Do not rub it dry but pat it dry. This prevents the towel from wiping off more alum and wearing the bar down more quickly. For most people, the alum block will prove to enhance their shaving experience and provide healthful benefits in the process. However, it should be noted that the astringent properties of the salts in the alum bar may be contraindicative to sensitive skin. People with very sensitive skin should experiment with a small portion before investing in a full-size bar. The best razor for sensitive skin should be used in the process. The best way to do this is to ask for it at your local barbershop. This will allow you to see if it will work for you. As for general safety, the answer is yes, it is safe to use, but with caveats. Alum contains salts, and excessive use can lead to adverse effects in the skin. For starters, the drying nature of the salts can cause the skin to crack and become easily irritated over time. If the skin is too dry, your skin may counteract this by producing an overabundance of sweat and oil. This will make your skin appear greasy even after using the alum. Lastly, for those with sensitive skin, it is not recommended for daily use. Even if you shave daily, it is best to only use it every couple of days. If you have been using it daily, just think about how much longer your bar will last by switching to occasional use! Another benefit of utilizing these bars is that they are a great indicator of just how well (or not) you shaved. Alum bars have a distinct tingling sensation when applied to areas where the skin is either bleeding or lacerated. 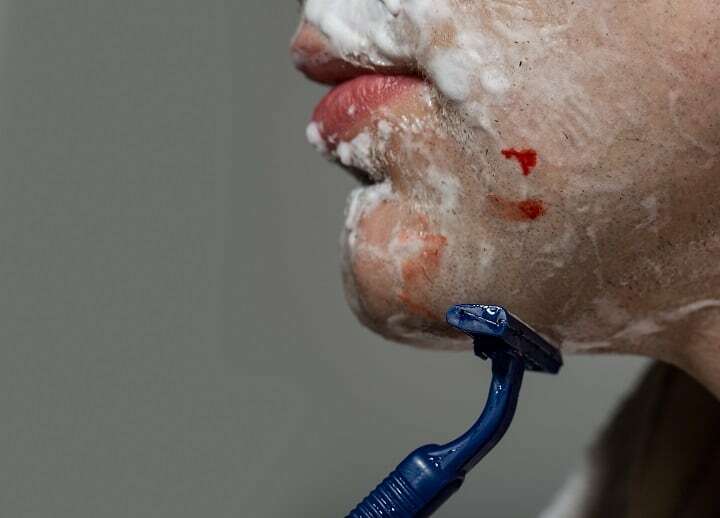 If you feel this sensation even in areas where no bleeding is occurring, it may be an indicator that your razor is dull, or you need to take better care in how you shave. Essentially, if you shaved with a sharp razor and stroked the blade in the proper order, the tingling sensation should be at a minimum. However, if you were not gentle with the strokes and used a dull blade, the sting sensation will be prominent. Thus, alum is great for telling you that it is time to change out a blade. 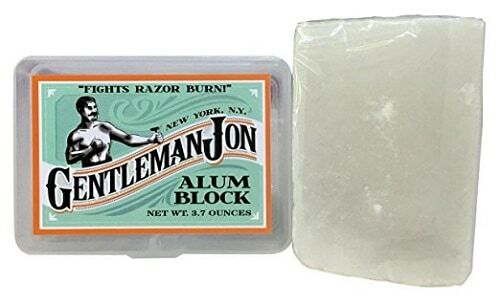 Antiseptic and astringent properties of Gentleman Jon Alum Block make this product work quickly when stopping the bleeding from minor nicks and cuts. Alongside with that, this alum helps in toning your skin after a close shave. More importantly, you won’t have to deal with any irritations or razor burns as it will prevent them from occurring in the first place. Providing that it comes in the size of 3.7 oz or 105 grams, you can use it every day and still have it last for months, maybe even years. For the size and the amount of time it lasts, this item has a bargain deal price. Also, it comes with a durable plastic case which you can use as storage. 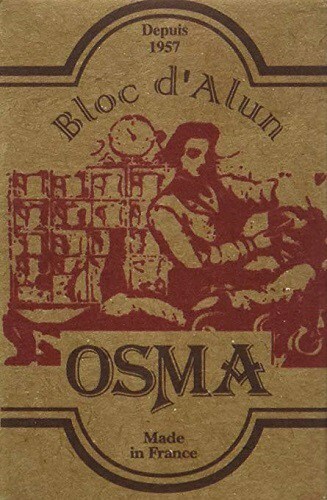 If you shave with a straight or double edge razor, nicks and cuts are bound to happen often, which is why Osma Alum Block is something you must have in your grooming kit. You get 2 blocks of 2.65 oz for the price. Although small, they will last you for a while because a little goes a long way. Make sure not to leave the product on your skin for longer than 30-40 seconds, as this is just about enough time for it to take effect and stop the bleeding from the nick. A first few seconds you will notice that it stings a bit, but this sensation will quickly fade leaving you with no razor burns or irritation. Unlike some other options, this alum doesn’t feel rough when you’re rubbing it on a wet face. The only thing you should take care of is not to drop it as it’s a bit slippery and can crack easily. A nice cooling sensation after stopping the bleeding from nicks and cuts is what The B.I.G. Company Alum Block provides, along with tightening pores and dealing with razor burns. Since the first use, you will notice that this product starts working almost immediately, giving your skin an instant relief after close shaving. A convenient container it comes with is made of hard plastic which makes it easy to pack for the travel. Also, the case prevents alum block from breaking as it’s very fragile and cracks easily. With the size of 3.5 oz, this item will last you for a very long time. For this size of the block, it’s really worth the money, although it’s not really that expensive in the first place. As a bonus, you get a free shaving guide ebook. 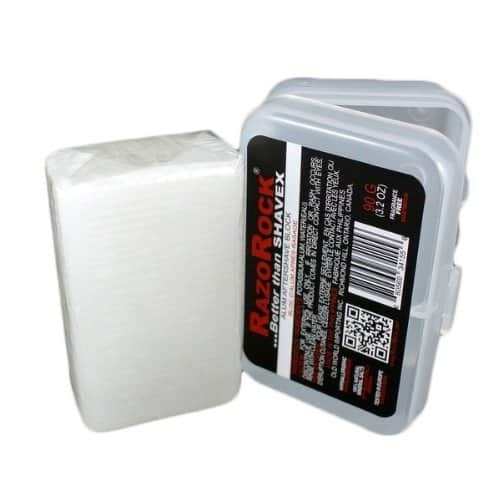 The most important benefit you will experience when it comes to RazoRock Alum Block is fewer razor burns and irritation. With its antiseptic properties, it will stop the bleeding from nicks and cuts and close the pores, making your skin tight and smooth. This product has multiple purposes and you can also use it as a deodorant, facial toner that prevents acne on the oily skin and an odor remover. As it doesn’t contain any harsh chemicals, you can use it safely without worrying that it will cause you skin problems. Coming in a size of 3.2 oz it will last you for a few months, or even the whole year with proper use. The product comes in a handy plastic container that you can use as storage. As one of the largest alum blocks on the market, Parker Safety Razor comes as a solid crystal and given the size of 125 g, it will last you for many years to come. Because it’s large, the product is easy to handle and not slippery, so it’s unlikely that you will drop it while using it. The item works great in sealing any nicks and cuts and stopping the bleeding thanks to its natural antiseptic properties. It doesn’t sting at all when applied. Instead, it gives you a nice and cooling sensation, making your skin feel refreshed and clean. 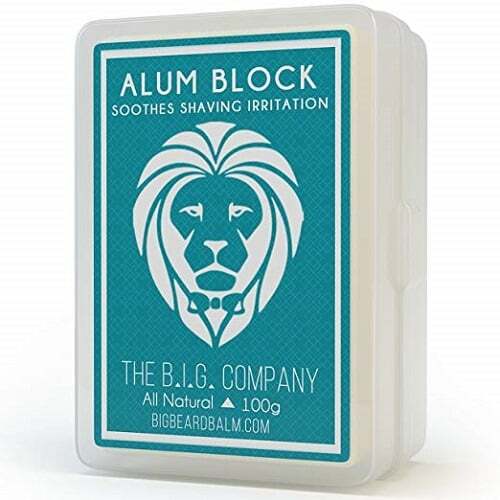 If you’ve been dealing with any irritation, this alum block will soothe it efficiently. Also, you won’t notice any salty residue compared to some other similar products. In addition, you get a handy plastic travel and storage case to put it away when needed. If you want an alum you can also use as a deodorant, Taylor of Old Bond Street might be something you want to look at because it has antiperspirant and antibacterial properties. However, its primary purpose is to stop the bleeding from nicks, scratches and other shaving-related cuts. Once it does this, it will leave you with a cooling and soothing sensation. In case razor often causes you irritation, this product will help calm it while toning your skin nicely along the way. You will feel slight stinging on the application, but this will pass very quickly. Make sure not to drop it as it will shatter into pieces and get sharp on the edges. If this happens, don’t worry, you will still be able to use, but it might be tough on your skin. Finally, this item won’t dry your skin and it will last you for a very long time. 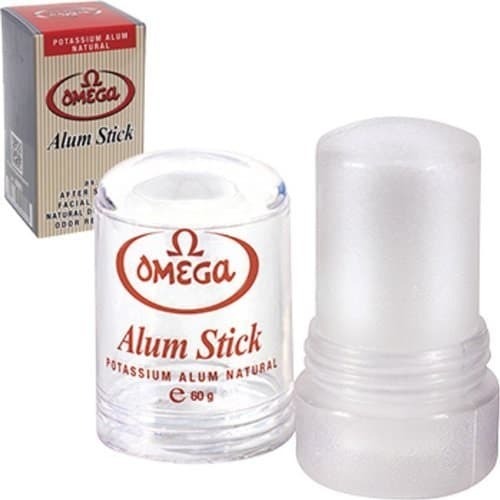 Affordable price and speed in stopping the bleeding and healing nicks and cuts are the main strengths of Omega Alum Stick. To use it you just need to moisten the top a bit and apply it directly to the cut. It’s likely that you will feel a slight burning for a split second, but after that, you will be left with a pleasant feeling. Also, your skin will feel much lighter and smoother. Although the stick comes in a small, around 2 oz size, it will still last you quite a while. When using this product, you don’t have to worry that it will leave you white marks on the skin because it doesn’t contain titanium dioxide, the ingredient that causes them. Make sure not to press it too hard against your skin, as sometimes the stick detaches from the plastic base and it can become hard to use. While it is probably very unlikely, it is best to see what if any allergic reactions might be associated with alum. If you already suffer from skin allergies, it is best to speak with your doctor before using a block as it may cause damage and pain to the skin. 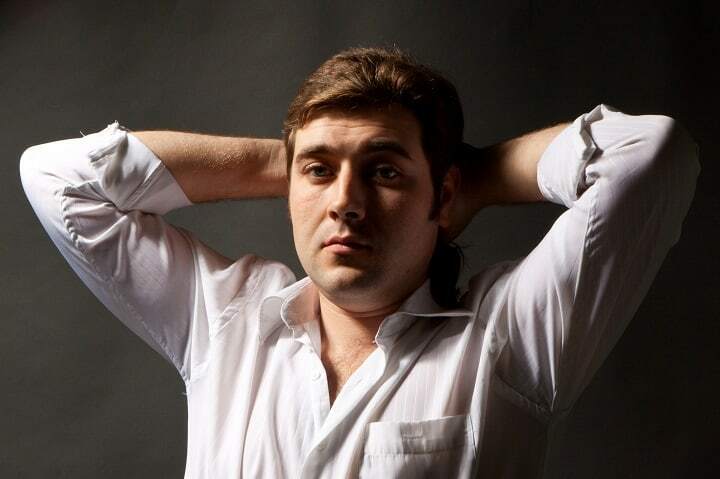 Ever ponder to yourself, what is shavette? Or perhaps you are wondering where to find to the best nose hair trimmer, the best styptic pencil, the best beard groomer, the best safety razor blades or the most stylish chukka boots. Visit our site today and read other informative blogs just like this one. You only have one face, and it is best to treat it right. Become well informed about proper shaving techniques and feel the difference in your shaving experience today. Furthermore, we have great articles that our beard enthusiasts are sure to enjoy.